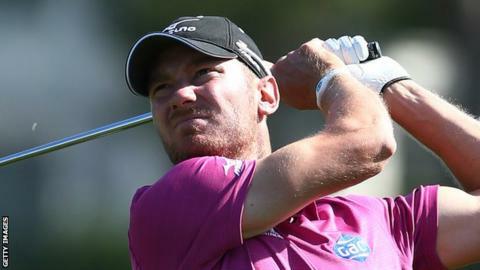 England's Richard Bland and Chris Wood are joint second after two rounds of the Turkish Airlines Open, two shots behind South Africa's Jaco van Zyl. Bland's 65 was helped by a front nine of just 28 shots to go 12 under par as Wood, 27, hit a second successive 66. World number three Rory McIlroy is back on 10 under after back-to-back 67s. Bland, 42, said: "I got told in the middle of the first fairway that I had sold my house and thought 'All right, better try to pay for the new one'." He is seeking his first European tour success in his 370th event. Northern Ireland's McIlroy is yet to drop a shot in his two rounds as he seeks his first tournament win since sustaining an ankle injury in July which stopped him defending his Open Championship title. He said: "They're as stress-free two 67s as I have shot all year. I definitely feel like there's a lot more to come." Leader Van Zyl, 36, followed his opening 61 with a second-round 69 to stand on 14 under par. England's former world number one Lee Westwood could only add a 71 to his opening 64 to finish nine under par alongside Ryder Cup team-mate Graeme McDowell, who shot a 65 in pursuit of only his second top-10 finish of the season.